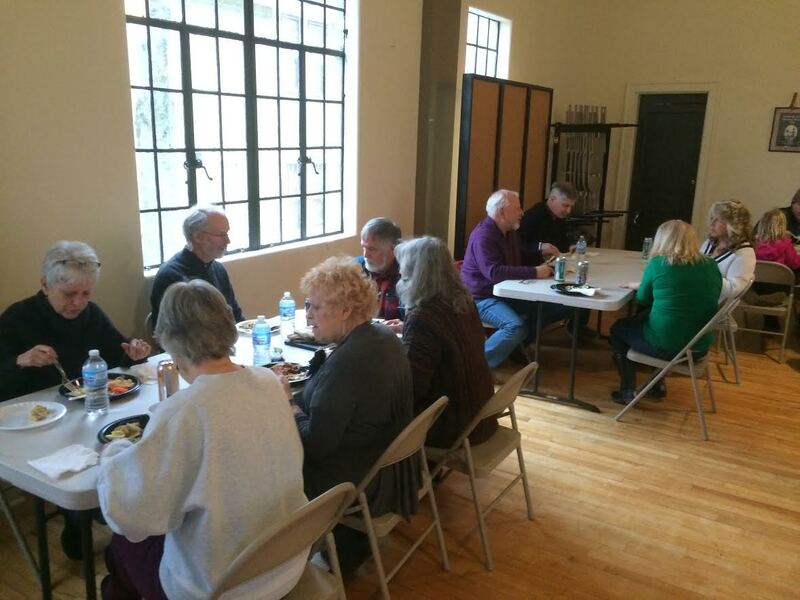 On Monday March 13, the Woodruff Place Civic Association hosted their annual spring pitch in dinner in advance of the meeting. A variety of salads, pasta dishes, desserts and beverages were available to those in attendance. The meeting featured a preliminary update on the earnings from the Casino Woodruff fundraiser, updates on the EID budget and resulting work on fountains, lights and other common area features, as well as general business and brief presentation from several local organizations including IMPD, Stopover, Lyn House, and the interim Mayor’s Neighborhood Advocate. Have you ever wondered how the Urban Times and Woodruff neighborhood flyers magically appear on your doorstep? These information sources are delivered to you via a group of wonderful Woodruff volunteers who take the time to make this happen. This is an easy task during favorable weather, but these ladies deliver the news in all kinds of conditions throughout the year. The next time you see them, be sure to thank them. Woodruff Place also has Keep Indianapolis Beautiful volunteer block captains who help keep the Woodruff Drives and sidewalks free of litter. Because of these volunteers, Woodruff has received free trees (most recently for Town Hall Backyard project), perennials, and annuals that are planted in Woodruff public areas. Woodruff Place would like to sincerely thank the following businesses and individuals for their donations to our 2017 Casino Woodruff silent auction. We are extremely grateful for your generosity and support! 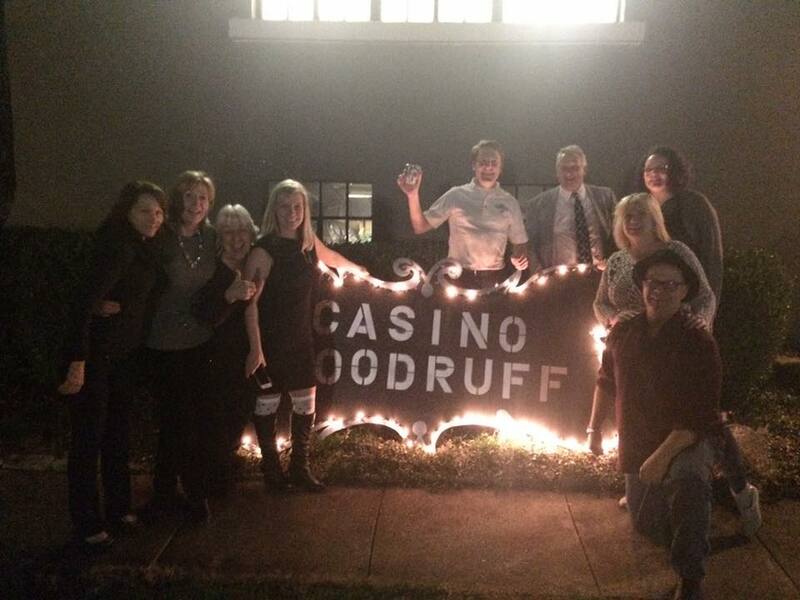 Like Las Vegas, Casino Woodruff was filled with bright lights, loud music, adult beverages, and happy people gambling the night away on March 11th. The Woodruff Place Town Hall was packed with Woodruffians and friends helping to raise money for the Woodruff Place Foundation. The Foundation funds help with the upkeep and improvement of the neighborhoods historic infrastructure. 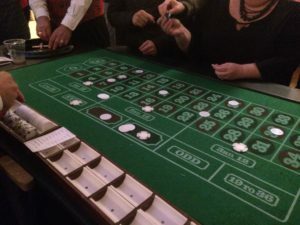 The Casino Committee was led by James Ryan and included Jennifer Vines, Katie Neill, Cliff Bradley, Eric Muelhausen, Kurtis Bowerstock, and Emily Scott. Cliff and Terri Bradley and the Cosmic Chrome Café provided the food and Stuart and Traci Robertson donated the beer and wine. Ted Tatnell served as the evening’s MC. 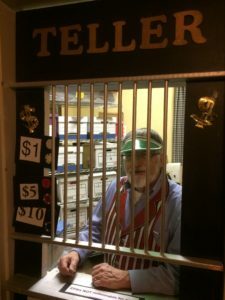 Many other volunteers bartended and served food, sold Jello shots and 50/50 tickets, sold chips, decorated, and helped with many other needed functions. 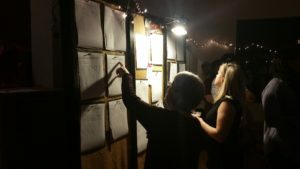 The Committee solicited a wide range of Silent Auction from area businesses, restaurants, bars, and neighbors. The contributors are recognized in a separate article. Bidding was fast and furious as neighbors competed to take home these prizes. Thanks to all those involved for a wonderful evening. At the November 13, 2016 Civic League meeting, the nominating committee comprised of Debbie Pidgeon, Missy Ellis and Jake Green, presented a slate of Board of Directors candidates for consideration. Jennifer Vines, Erik Muehlhausen, Cindy Brown and Kurtis Bowersock were approved and will be serving on the Board from 2017‐2019. Jim Leich was approved as the new President and will serve 2017‐2018. Jennifer Vines and her husband, Dr. Jason Eberl, moved to Woodruff Place in June of 2004. Jennifer served on the Civic League board from 2005‐2007, handled town hall rentals for 5 years, and was on the Progressive Dinner committee from the event’s inception through 2010. Erik Muehlhausen, a West Drive Woodruffian, moved to Woodruff Place from his downtown home four years ago with his lovely partner, Aimee, and son, Elliot. The immediate draw was the ever‐growing number of families found throughout the neighborhood and a larger house. Erik quickly realized that family was truly a recurring theme in Woodruff Place as he and his family experienced Flea Market, Home Tours, Progressive Dinner, fire pits, friendly porches and living rooms, all in short order among the many, many friends and families in Woodruff Place. Kurtis Bowersock and his wife, Jennifer, planted roots in Woodruff Place in November of 2012. The proximity to Downtown, along with accessibility to current and future‐planned bike paths, put Woodruff within their home search radius. They soon discovered the visual and historic charm, and when coupled with the realization that the community was something very special, it sealed the deal! Cindy Brown and her husband Gary, moved to Woodruff Place three and a half years ago. 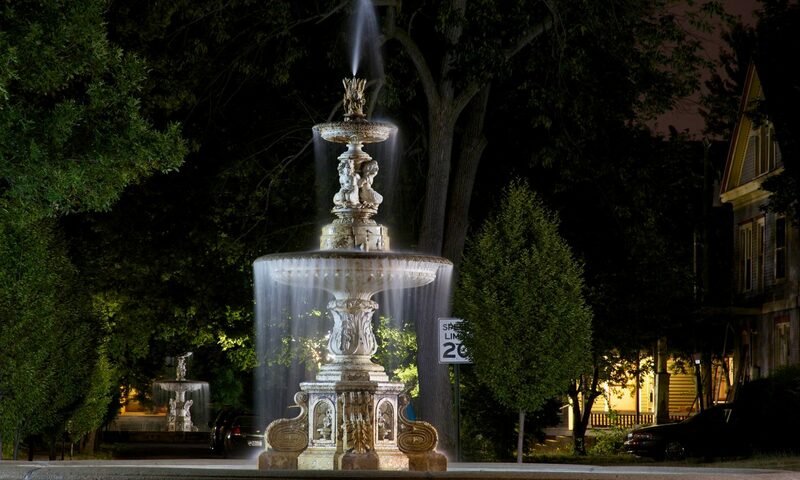 Cindy and Gary were drawn to Woodruff Place for the beautiful Victorian homes, the green esplanades, fountains, and overall grace. But finding in this place such a welcoming, close community of friends has been the real pearl. Jim Leich, previously serving as the Civic League Board Vice President and a resident of West Drive, has a long history of engagement in the neighborhood and the broader community. Jim was recently awarded the prestigious Sagamore of the Wabash at his retirement dinner in 2016 after having served as President /CEO of LeadingAge Indiana for 21 years.